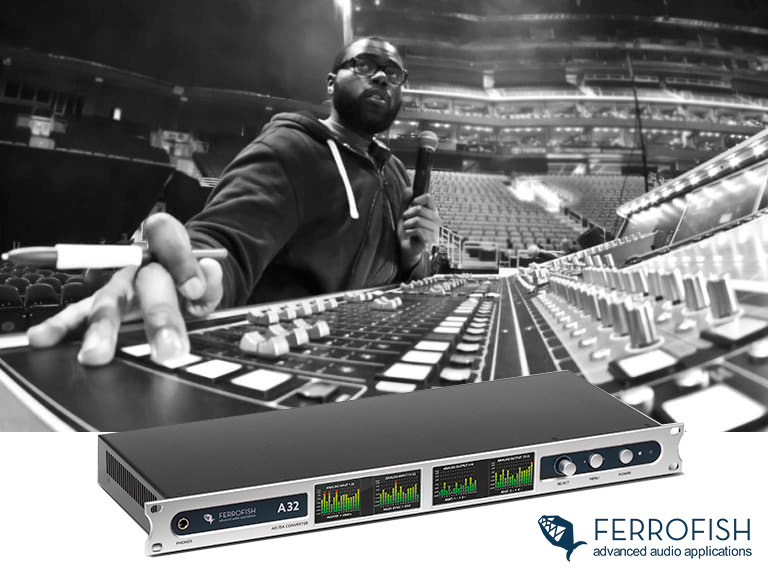 Digital equipment has come to dominate the live audio scene in modern times, with the number of benefits offered by digital systems making it impossible for engineers and to ignore. Smaller and more transportable setups (both equipment and cabling); the ease with which settings can be recalled; the option to perform ‘virtual sound-checks’; and the reliability offered by purpose-built formats such as MADI; all have helped to reduce setup times, simplify trouble-shooting and decrease overall production costs. On the flip side, one early complaint of digital audio was the sound quality, which many felt wasn’t on par with its analogue counterparts. And whilst today’s technology has certainly made this less of an issue, many musicians and engineers still have a soft spot for the sonic characteristics imparted by analogue and vintage equipment. American live engineer Brandon Blackwell of Blackwell Productions is one such advocate, whose preference is to remain analogue where possible. Fulfilling several roles in his work alongside clients such as Camila Cabello (X Factor USA), Blackwell specialises in FOH and monitors, as well as providing support to venues for events such as TV specials and theatrical performances. In order to integrate his existing analogue hardware into digital setups, Blackwell recently added the Ferrofish A32 AD/DA converter to his setup, which acts as a bridge between the analogue and digital worlds. With the Ferrofish A32 featuring MADI I/O on both optical and coaxial BNC, Blackwell also has the options he needs for interfacing with digital consoles, such as the DiGiCo desks he regularly uses for his live work. With a “major pop tour” planned in the summer, Blackwell has been testing out the A32 on a variety of recent shows in preparation. And since he can get all of his AD/DA and MADI conversion out of a single 1U rack unit, he can happily travel light to any one-off gigs, with the A32’s redundant power supplies also providing a level of failsafe that’s crucial for live shows. MADI and ADAT digital connections, 4x TFT displays, and redundant power supplies. The Ferrofish A32 is a 32 in, 32 out AD/DA converter with ADAT and MADI connectivity. Other features include comprehensive front panel displays, with level metering for all 64 channels visible at any time, and a super-simple and intuitive menu system. Dual-redundant power supplies provide an additional level of security, making it perfect for studio, live and broadcast. Dante connectivity is also available as an option (see the Ferrofish A32 Dante), and 16-channel versions are also available in the form of the Ferrofish Pulse 16 range. Ferrofish has also just announced the beta release of RemoteFish, a new control software GUI for control of Ferrofish converters. 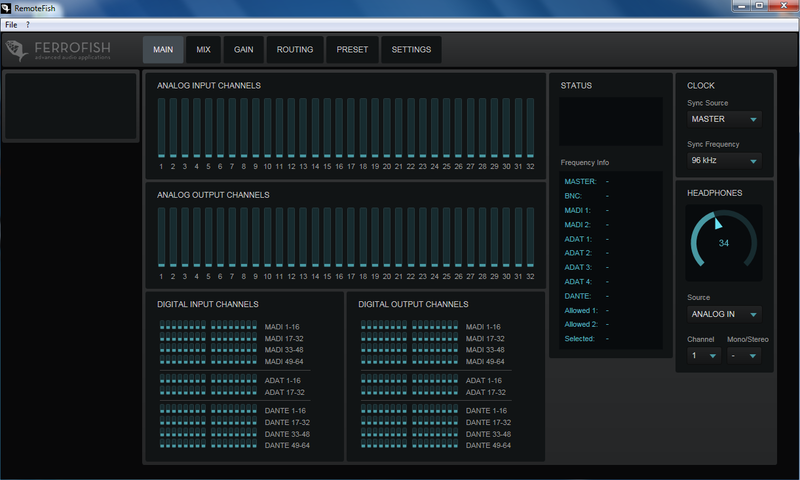 Levels, gains and channel routing can now all be controlled remotely from a computer via USB, MIDI, or MIDI over MADI. RemoteFish is currently Windows only and is available for the A32 and A32 Dante, with support for the Pulse 16 range coming soon. RemoteFish also requires that you upgrade your device to the latest firmware. Both are available to download free from the Ferrofish website. If you’d like to know more about Ferrofish AD/DA and format converters, give us a call on 01727 821 870 to speak to one of our team or to arrange a demo.